TBS100 top and bottom pressure sensitive tape machines are designed and manufactured to withstand work loads and conditions of real world production environments. The TBS100 uses a simple rugged side belt drive system with oversized motors and sealed flange bearings for extended machine life. Available in top and bottom, top only or top and bottom. 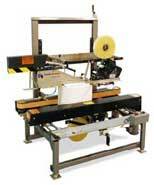 Combi Packaging Systems LLC, 5365 East Center Dr. NE, Canton, OH 44721. Tel: 800-521-9072; Fax: 330-456-4644.